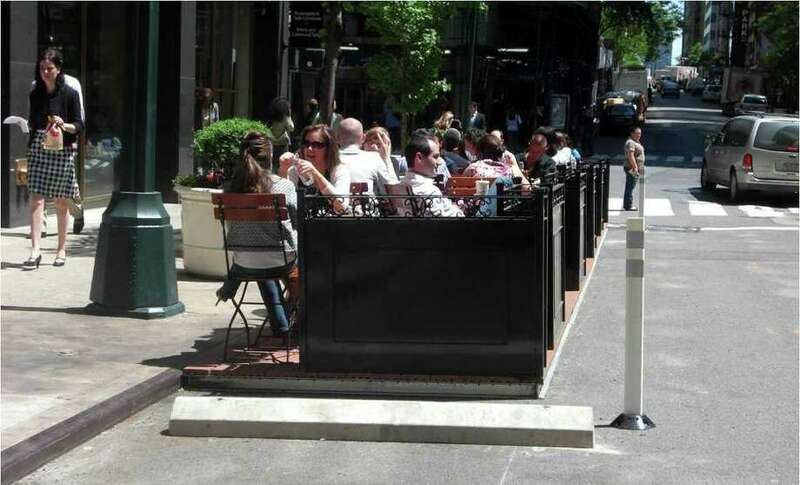 Pop-out seating, seen here at 44th Street and Third Avenue in Manhattan, converts parking spaces into outdoor dining areas. Westport gastronomes may soon have an expanded menu of outdoor seating options, as the Board of Selectmen prepares to review a new proposal that seeks to enliven the downtown dining scene. Developed by a planning subcommittee led by Planning and Zoning Commissioner Howard Lathrop, the new plan seeks to allow restaurateurs in the town center to convert parking spaces along street curbs into public seating areas. Also known as "pop-out" seating, this type of outdoor dining has become popular over the last couple of years in New York City and San Francisco. The selectmen will review the proposal at their meeting set for 4 p.m. today in Town Hall. "On Main Street, except around Oscar's and Tavern on Main, there's not much space," Lathrop said. "I saw in the city, this pop-out idea at 44th Street and Third Avenue, and I said, `That would work very well on Main Street.' "
Use of pop-out seating would be limited to one-way streets such as Main Street, Church Lane and Taylor Place, Lathrop said. The new seats would sit at ground level or on platforms, would be accessible to disabled patrons, and be protected from traffic by markers such as plant containers. "From an urban planning point-of-view," Lathrop said, "whatever you can do to quiet the traffic, to slow it down, the better for the entire environment because you have pedestrians walking everywhere." Lathrop added that pop-out seating would be feasible in front of the Main Street establishments Bobby Q's and Westport Pizzeria, in front of Cafe Manolo on Church Lane, on Taylor Place next to the Crumbs Bake Shop and in Parker-Harding Plaza next to Acqua Ristorante Mediterraneo. Pop-out seating is the first of several ideas focused on beautification and pedestrian access that Lathrop's panel plans to present to the board of selectmen. The subcommittee -- which also includes Westport-based developer David Waldman and Drew Friedman, a longtime commercial property owner in the town center -- is also working on plans for new sidewalk landscaping and improved striping for crosswalks. Lathrop's subcommittee is one of several downtown planning groups that have been formed by P&Z commissioners following a public meeting in May, which sought to engage residents and community and business leaders in drafting and implementing revitalization initiatives for the town center. "There's a lot of civic pride, and the response has been great so far," Lathrop said. "It's encouraging." Bob LeRose, owner of Bobby Q's and president of the Downtown Merchants Association, said if the proposal were approved he would consider installing pop-out seating in front of his restaurant. "What I like about this idea is that it provides equal opportunity -- it's great for each restaurant and the town," he said. "It would improve the streetscape and would be a step in the right direction in terms of the long-term vision for downtown." But the pop-out seating proposal does not win support from all downtown restaurateurs. "There won't be places for parking if you take spaces out for tables," said Mel Mioli, owner of Westport Pizzeria. "I don't think it would work. I'm against it." Conversely, Pedro Garzon, owner and chef of Cafe Manolo, said he fully supports the idea. "Anything that would bring vitality and people to downtown and build some sidewalk culture, I'm all for it," he said. Garzon added that he welcomed other initiatives that could attract more dining establishments to Westport. "We have Mario Batali's restaurant in town, we have Shake Shack, everything is good," he said. "The more Westport opens itself up and allows a celebration of life, a joie de vivre, that would be awesome."